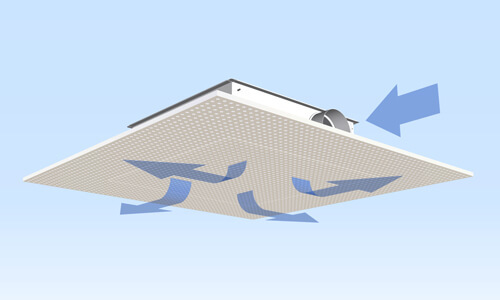 The Knauf / LTG AirPanel is an air diffuser ceiling element for effective ventilation and best room comfort in rooms of all kinds. It consists of the Knauf AirPanel as an unobtrusive visual surface and the LTG AirPanel Diffuser installed in the ceiling. This integration renders the ventilation element virtually invisible apart from a narrow gap. In contrast to conventional, always dominantly visible, air passages, the Knauf / LTG AirPanel guarantees best and effective 360 degree ventilation without drafts even through the ceiling – completely integrated into the ceiling appearance. The innovative LTG flow technology nevertheless achieves an even temperature distribution and thus a pleasant room climate. The sound-absorbent effect of the acoustic elements is, of course, retained, so that the Knauf / LTG AirPanel offers true added value.